Laos has had over 20,000 casualties attributed to ordnance left from a war that ended nearly forty years ago. The greatest killer is the cluster bomblet. Not much bigger than a tennis ball but with an effective killing zone 30 yards in diameter. An estimated 70 to 80 million clusters still litter the country, threatening lives and hampering economic development. America dropped at least 280 million cluster bomblets on Laos during the nine years of the “Secret War” and experts estimate that between 70 and 80 million of them still lurk in the soil, contaminating nearly 25 per cent of Laos’ 10,000 villages. 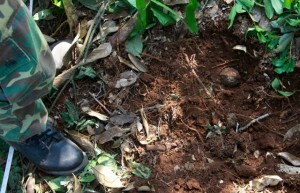 We continue to find numerous cluster bombs in the coffee gardens we’re clearing. That’s good for several reasons. The discoveries confirm the importance of our project. If the villagers in Dak Yoy had jumped the gun and started planting coffee trees in these badly contaminated fields, there’s a high likelihood that some poor soul would have struck a bomblet with a shovel or hoe. The thirteen bomblets the guys found today were scattered over an area less than an acre in size. All were within a foot of the surface and, due to corrosion, were nearly indistinguishable from the rocks around them. The BLU-26, pictured above, is not much bigger than a tennis ball but, upon when it explodes it propels 300 steel ball bearing at ballistic speed, creating an effective kill zone about 30 yards in diameter. The entire team benefits every time a deminer finds a bomblet or other piece of ordnance. When the men know that lethal objects are underfoot they need no reminder to step lightly around the site and to patiently excavate with small, calculated movements.